The concept of leveraging technology to improve the user experience and increase hotel revenue simultaneously is what we call Predictive Personalization. It’s a two-step process whereby you apply machine learning techniques to understand user behavior, and then personalize his or her experience by automatically presenting the best content and offers for that individual. You might ask yourself—isn’t that already being done? But the big leap here is that this prediction happens in real time. It’s also much more sophisticated, not based on a few simple rules, but on hundreds of variables that interact with each other. So far, the offer problem has been tackled using conventional revenue management—finding out the price per room that maximizes revenue for the hotel using demand analytics and shopping competitors’ pricing. You’ll notice, however, that a key stakeholder is missing from this approach, and that is the traveler. How can you talk about personalization if the price is the same for every user, no matter what his or her preferences are? We need to add the user into the equation and start thinking in terms of “full offer” and not only price. In this way, we can then dynamically change the offer to match each individual user’s inclinations. 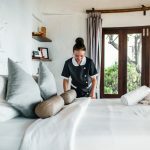 Is housekeeping opt-out right for your hotel? Financing hospitality development projects: What every developer and sponsor needs to know.